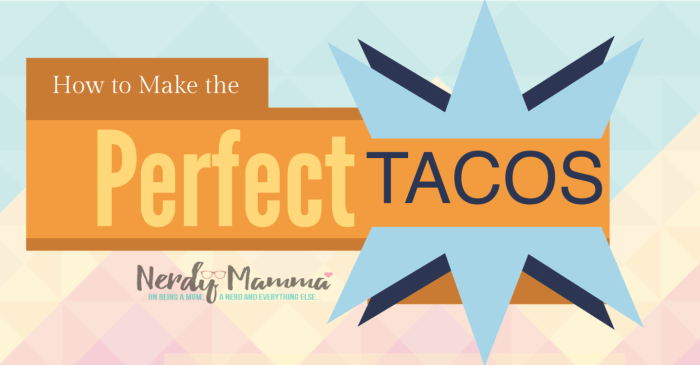 You, poor sap with the taco-addiction, but also with the inability to eat your taco like a grown woman (man, whatever gender you choose to associate with at the moment), these 10 Hacks for the Perfect Taco are for you. Because, you may not have realized it, but you’ve been making tacos wrong your whole life. Well, only if you haven’t already been doing these hacks. This is critical: Always use fresh ingredients. I love a good leftover lasagna or 2-day stew. But tacos are a whole ‘nother matter. You must use the fresh to get the best enjoyment. Always, always, always, warm those taco shells. I think it has something to do with the activity level of atoms in the tortilla or shell, but when they’re cold, they have a tendency to break and fall apart. Whereas a warm taco, with the atoms moving faster, is able to retain its shape. So, pop those babies in the microwave if you must, although the oven is my preferred warmer, and get those atoms moving! Drippy tacos, squishy tacos, MOIST tacos–gross. If you want a tasty taco with less mess and more yum, drain meats, even tomatoes and other veggies, and keep the liquid to a minimum. Use light seasoning, friend. Seriously. Think of all the flavors that will already be in the taco–you don’t need to add 2 gallons of cumin. Let the seasoning happen, but at a minimal level. Thank You For the Compliment, Sour Cream. Speaking of the flavors, contemplate them before you assemble your tasty treat. In a traditional taco, you’ve got the cool, smooth flavor of the sour cream offsetting the deeper, meatier flavor of your ground beef or steak. But this goes for your fish tacos and chicken tacos and even dessert tacos. You want the flavors to offset each other so you’re getting a party in your mouth. And all the talk about offsetting? Yeah, make your taco your whole meal. The best tacos are the ones that hit all the high points of a good meal. So, think of that food pyramid you saw in elementary school. Do a little bread (tortilla), a little meat (even if it’s a vegan alternative), a little dairy (even if it’s a vegan alternative, again), a little veggie–make sure it’s all there. Toss in fruit (like a tomato)…I mean, dude. This is serious. All the best homemade tacos are anchored with a homemade seasoning. You can use the stuff in the packet in a pinch, but taking the time to tailor your seasoning for the pieces you’re mixing together in your tortilla will make for a better nummy. When assembling tacos–take the time to stuff them for maximum enjoyment of each bite. Do not clump and dump. Spread and smooth. That means that if you are a weirdo and eat your tacos from top to bottom, you should smooth your goodies on the side. Clearly, if you’re a sane person, you eat from one end to the other, so you need to slather everything from one end to the other. Stand tacos up–a taco that lays flat is determined to fall apart. I like this awesome taco stand my husband printed for me on our 3D printer…if you need one, just lemme know–We’ll get you hooked up. Use small portions to stuff your taco. That way you can take big bites, and get a little bit of everything every time. The worst thing is when your taco is too full and either spills everywhere or just dumps itself into your hand. Ugh. 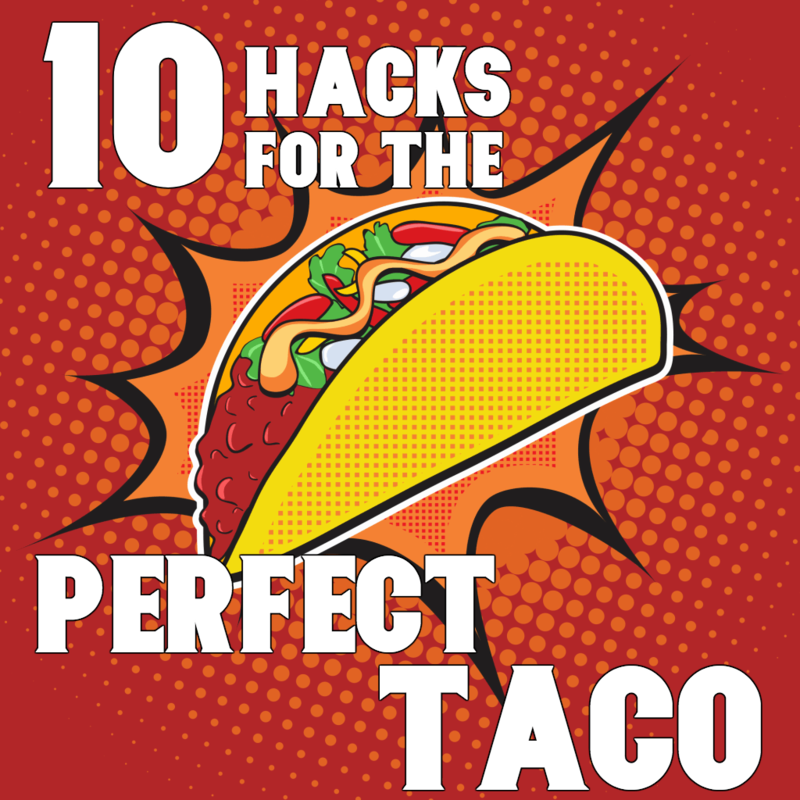 If you loved these 10 Hacks for the Perfect Taco, be sure to pin it so that you can come back to them the next time you’re making a passel of tacos for the fam.